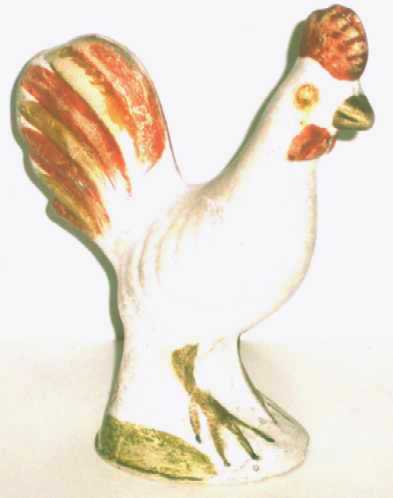 Presented here, a fine 19th century Pennsylvania Chalkware figure of a Rooster with reddish/orange and gold highlights, brown feet and beak, and olive green base, 6-1/2" high. Very nice molded detail to the wings. That, along with the multiple colors make this a very special piece of chalkware. Condition is very fine and the colors are more muted than shown in the picture. Wonderful patina.